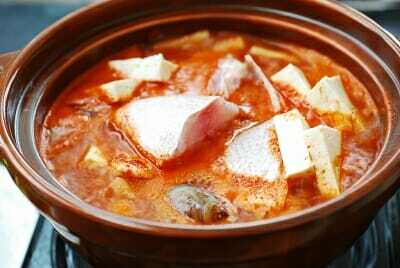 One of the classic Korean stew dishes is this spicy fish stew, called maeuntang (매운탕). 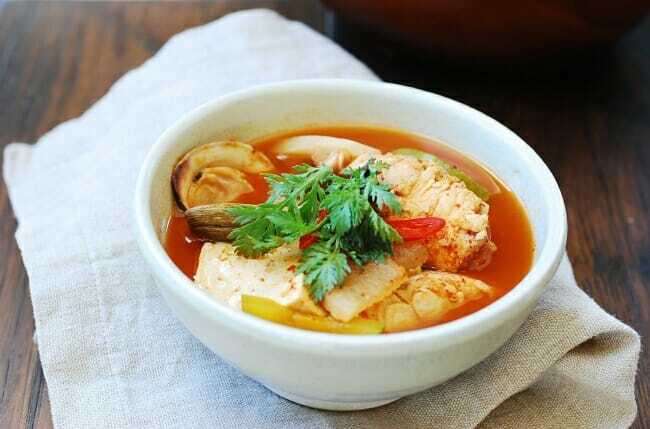 In Korea, maeuntang is made with all sorts of fish, including freshwater ones. 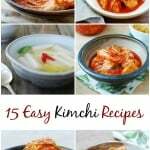 For this recipe, I made it with a red snapper (domi, 도미), which has a firm, white flesh with a mildly sweet and nutty flavor. 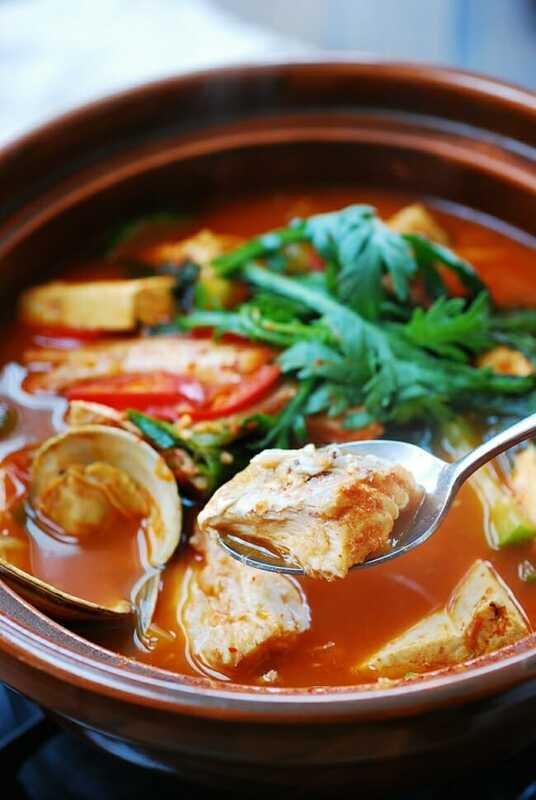 Maeuntang is a general term for spicy stews, but it’s commonly used to refer to spicy fish stews. 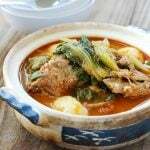 “Maeun” means spicy. 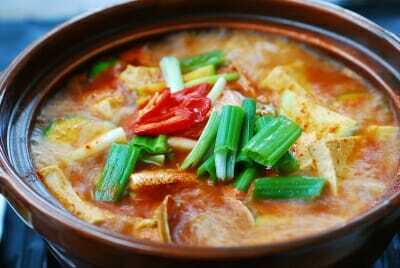 “Tang” is a term used for certain types of soup (guk), such as seolleongtang and galbitang, or sometimes for certain types of stew (jjigae) dishes, such as gamjatang and maeuntang. 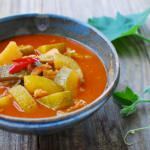 Traditionally, the term “tang” was used for elaborate soups or stews, but it’s loosely used in modern days. 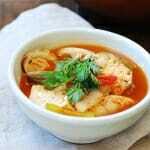 For this stew, you can use any firm, white flesh fish. 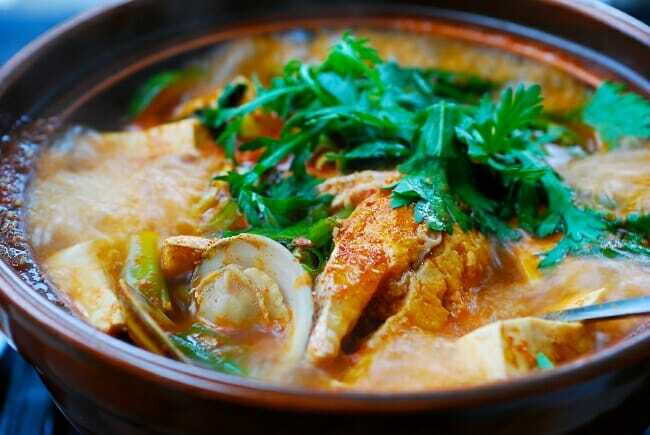 Cod fish (daegu, 대구), monkfish (agu, 아구), black rockfish (wooreok, 우럭) and yellow croaker (jogi, 조기) are some of the common ones. 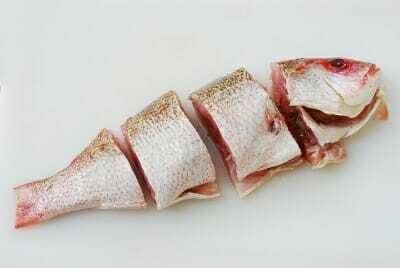 We normally use a whole fish cut up for this dish, including the head and bones. You can ask the fishmonger to clean and cut it for you. 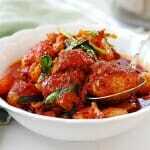 If preferred, use fish fillets, but the head and bones are great for flavoring the stew. Be sure the fish you buy is absolutely fresh! In Korea, a great number of restaurants specializing in seafood have an aquarium(s) in house, where live fish are kept. This reminds me of maeuntang we had in Tongyeoung last fall, a southern coastal city of Korea. We arrived late and very hungry. After being turned away by several restaurants which were closing, we were invited in by a nice lady at a small restaurant. She made us maeuntang with a couple of fish she caught from her fish tank outside. She also allowed me in her kitchen to watch her making the stew. Her maeuntang was a memorable one! 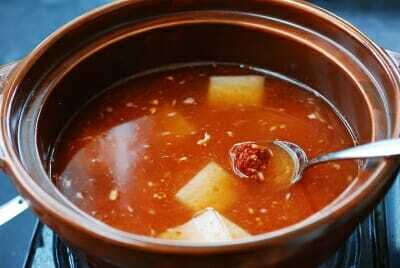 As with most of Korean stews (jjigae), anchovy broth is used for this dish to add depth to the stew. 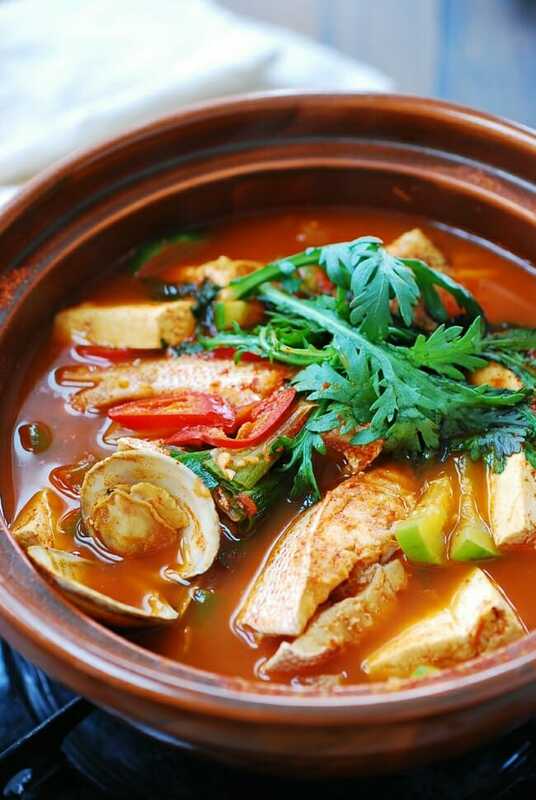 I like to throw in some clams (or shrimp) to add another layer of flavor to the broth. 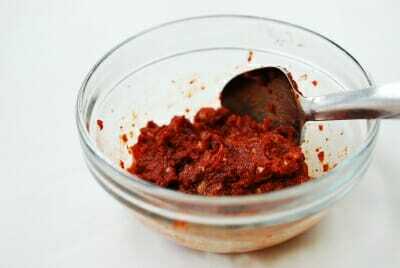 Finally, adjust the spicy level to your taste by reducing or increasing gochugaru. 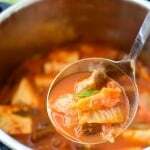 For a mild tasting fish stew, see my daegu tang recipe. Clean the fish, remove guts, scales, and fins, if not already done by the fishmonger. Rinse and scrub the clams. Place the clams in salted water (1 tablespoon of salt in 2 to 3 cups of water) for 30 minutes or longer to get the clams to spit out the sand. Clean the vegetables. Cut the radish into bite sizes. Thinly slice the scallions and the pepper. 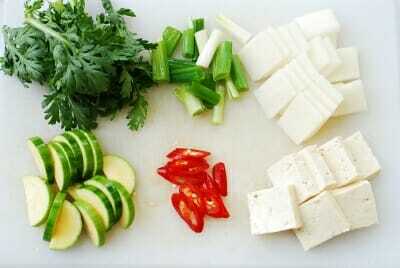 Cut the tofu into 1/2-inch thick small pieces. In a small bowl, combine all the seasoning ingredients and mix well. Add the broth to a medium size pot along with the radish and the seasoning mix. Bring it to a boil over high heat. Cook until the radish turns soft, about 3 minutes. Add the zucchini, enoki mushrooms, and scallions, and boil for a minute or two. Place the watercress or crown daisy leaves on top. Turn the heat off. Serve piping hot with the optional lemon slice on top. 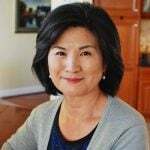 Hi Erin – Yes it sounds like it was maeuntang. Please simply omit shellfish if preferred. 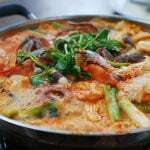 I use it to add another layer to the broth but it can be omitted. 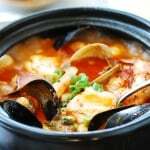 Koreans make maeuntang with or without shellfish. It’s a matter of preference or sometimes depending on what’s available. I know nothing like a stew made with fish fresh from the ocean, but hope this recipe is close enough. Enjoy! Hello Hyosun ssi.. i would like to ask you, when should we put in the zuchinni? And please note that there is no enoki mushroom in your ingredient list. Thank you ^^. Oops thank you for letting me know. Fixed it. Oh so sorry. I thought I did. Now added. Cheers hyosun you are the best korean food blogger, anyway did you ever try indonesian food??? I was searching for it finally!